Montreal is a city that is full of music all through the year. Especially during the annual event, Le Festival International de Jazz de Montréal, music is everywhere, beyond the Festival itself. 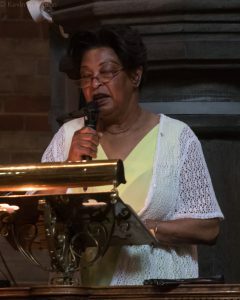 One of the most notable events was the Jazz Mass that took place on Sunday, July 1, 2018 at The Church of St. John the Evangelist, aka “The Red Roof Church.” The service, hosted by eminent Canadian educator professor Norman Cornett, started with a moving rendition of “Amazing Grace,” with some call and response with the congregation. Jazz vocalist Ranee Lee, Juno Award Winner and member of the Order of Canada, talked about friendship and said that her best friend was her beloved husband, Richard Ring. Richard was also her longtime mentor and her guitarist. She shared the news with the audience that he was fighting for his life. She said that although it was a fight that he wouldn’t win, his legacy, musical and otherwise, will live on. She also spoke of the importance of music in everyone’s life, whether they listen, teach, or perform. She ended her talk with a beautiful and heartfelt a cappella performance of “This Little Light of Mine.” Sadly, later that week on July 6, the day before Ranee had a Festival concert at L’Astral Club, Richard Ring lost his life. 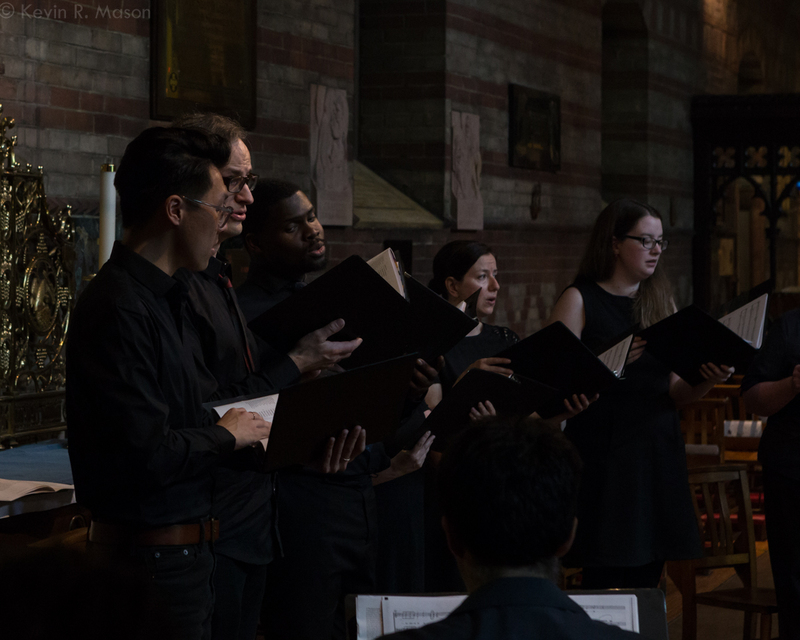 Because he would have wanted the show to go on, Ranee went through with her concert, displaying the same grace under pressure that she showed at the Jazz Mass. 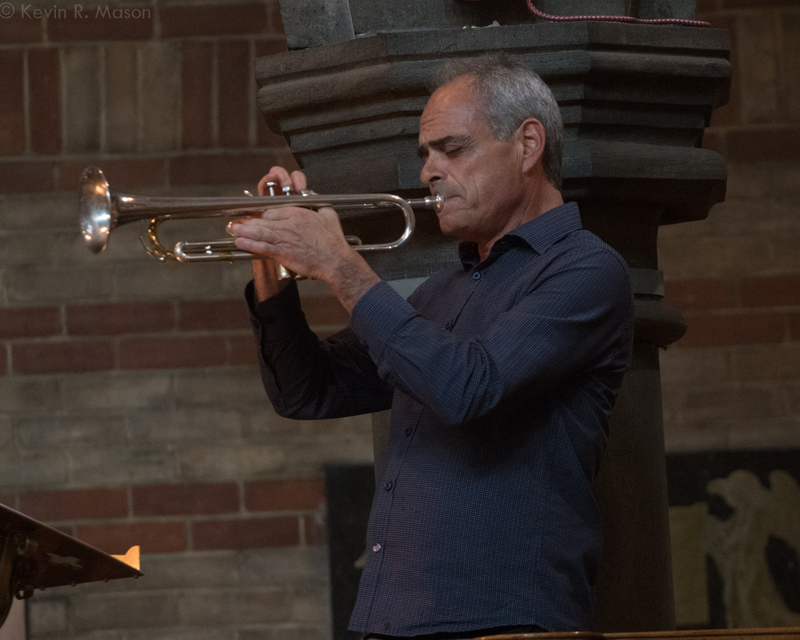 Renowned Canadian trumpeter Ron Di Lauro played a lovely “Tenderly.” The choir and jazz ensemble of The Church of St. John the Evangelist performed exquisitely throughout the service, adding so much to the proceedings. 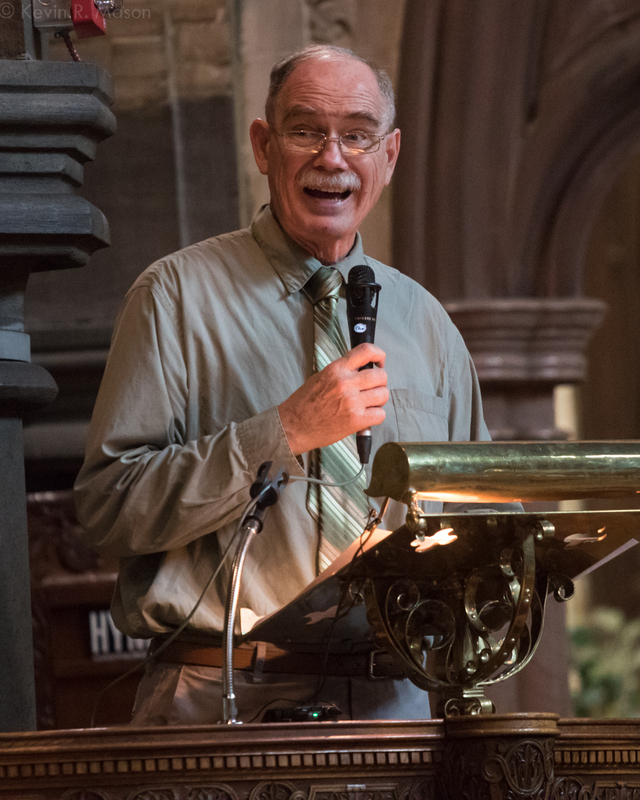 During communion, Ron Di Lauro played a beautifully touching version of “Body and Soul.” The music of the mass, “The Kyrie” and “Sanctus Bendictus” are from A Little Jazz Mass by Bob Chilcott. It was a very uplifting service, with a great deal of comfort and joy that touched the hearts of the congregants and visitors. 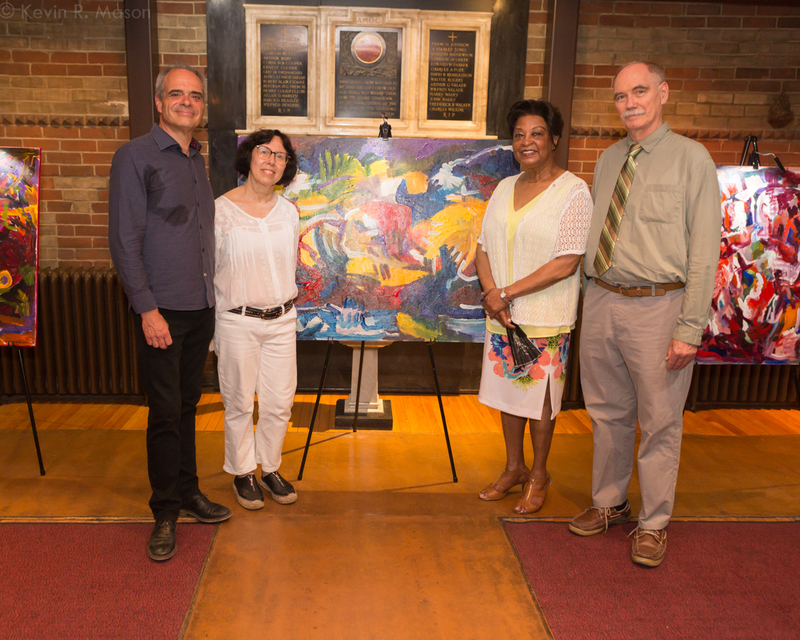 After the service, Professor Cornett hosted a reception of an art exhibit at the church that he curated by artist Sonia Indelicato Roseval. She was born in Tunisia to an Italian mother and a Polish father. Throughout her life, she has easily transitioned back and forth between figurative and non-figurative painting. The exhibit was called “The Enigma of Jazz.” With vibrant splashes of color, the visually arresting collection was very evocative. At the reception, she spoke about her art, and other subjects. She discussed her practice of meditation, which she has been doing for several years. She studied meditation with spiritual leader Sri Chinmoy, whom she said taught her a lot. On the subject of painting, she said that colors are like her own tools of improvisation, much like the improvisation of jazz. 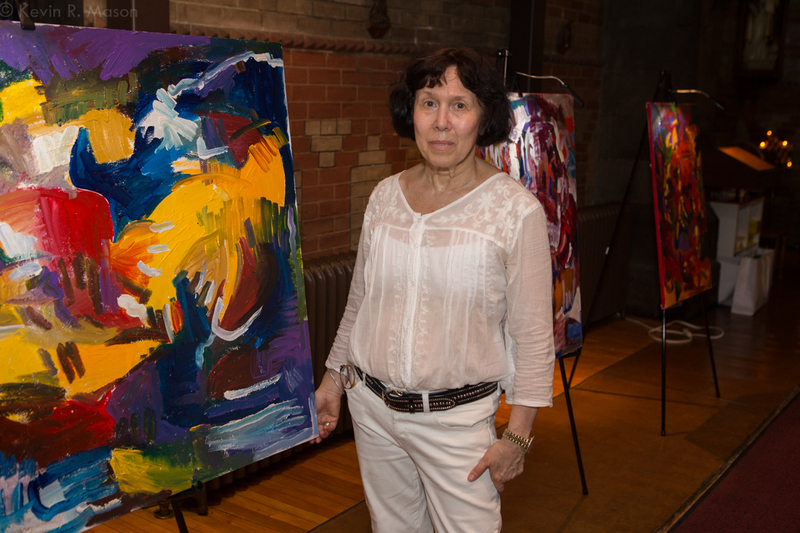 Sonia added, “Art is not something to keep to yourself…I cannot stop painting.” She continued, “We’re on this earth to acknowledge our humanity…life is a gift. I’m celebrating life in all its aspects.” Ms. Roseval also spoke about her 96-year-old mother, whom she looks after, and finds to be a source of great inspiration. Sonia always lives in the moment, and she doesn’t dwell too much on the past. She is a deeply spiritual person who embodies her art. When you see her paintings, her dedication and passion are very clear. For more information about this talented artist, go to: www.soniarosevalartist.com. 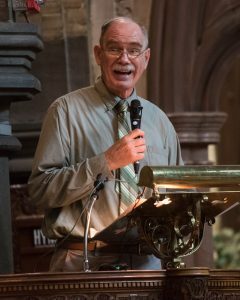 Professor Norman Cornett is a specialist in theology and the arts, and he is widely known for his “Dialogic” Workshops. In recent years, he has hosted Dialogic Workshops with Vijay Iyer, Matt Herskowitz, Jane Bunnett, Gwilym Simcock, David Murray, Marc Cary, David Binney, Wadada Leo Smith, Kurt Rosenwinkel, Tord Gustavsen, Karen Young, Oliver Jones, and Jean-Pierre Zanella, just to name some of the artists he has presented. A noted documentary by Alanis Obomsawin (one of Canada’s most distinguished filmmakers) titled Professor Norman Cornett, tells the story of Cornett’s life and educational approaches. For more information about the Professor’s activities, go to: http://www.cdedec.com. To learn more about the mission and upcoming events at The Church of St. John the Evangelist, go to: www.redroof.ca. «Next Post The 2018 White Plains Jazz Festival – Coming Soon!